Manchester City has earned a place in the FA Cup final by defeating Chelsea 2-1. It was the second of the semi finals as the first one was played yesterday between Millwall and Wigan Athletics. Wigan won that contest 2-0. Chelsea start slowly as it looked jaded probably due to UEFA Europa League’s second leg quarter final encounter against Rubin Kazan played on Thursday. It was Manchester City which started aggressively and made some ferocious attacks. In the 35th minute, Samir Nasri opened the account for City when a save by Petr Cech from a shot by Calos Tevez earned him the possession and he made no mistake in netting the ball. The goal ended Nasri’s drought as he scored his first goal in 21 matches. Just a couple of minutes into the second half, Sergio Aguero headed the ball into the net on a cross by Gareth Barry to make it 2-0 in favour of City. However, Chelsea was not to be denied so quickly. The team was not ready to lose without a fight as the last thirty minutes of the game were dominated by Chelsea attacks. As a result, Chelsea’s Demba Ba earned the first goal in the 66th minute. Chelsea continued attacking the opponent and could have scored the equalizer when City’s Romanian goalkeeper Costel Pantilimon saved the ball on a shot by Demba Ba from Eden Hazard’s pass. There was a chance of getting a penalty by Chelsea in the 86th minute when Vincent Kompany tugged the shirt of Spanish striker Fernando Torres. However, the referee was far enough to misjudge the severity of the foul. 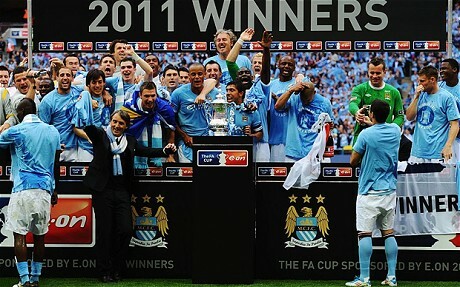 At the end, it was a hard fought 2-1 victory for City who will play the FA cup final for the second time in three years, having won the title in 2011 by defeating Stoke City 1-0. The player of the match was Yaya Toure.